Former University of Manitoba Bison hockey player and head coach Barry Trotz is making history as an NHL bench boss. On Dec. 30, John Carlson notched his fourth goal of the season against the New Jersey Devils. This goal proved to be the game-winner, as the Washington Capitals went on to smash their Metropolitan Division rivals 5-2. With the win, Trotz had his total wins as a coach move to 737 putting him in sole possession of fifth all-time in wins as a coach. Hailing from Winnipeg, Trotz downplayed the more newsworthy event of the night with some humour. “I’ve lost my hair. I’ve turned grey. I’ve gotten old,” he said in a postgame scrum. With the win, Trotz moved into sole possession of fifth all-time in NHL coaching wins. Ahead of him sit a quartet of future and current Hall of Fame bench bosses in Al Arbour (782), Ken Hitchcock (804), Joel Quenneville (870), and Scotty Bowman (1244). Trotz’s coaching career began in 1984 as an assistant with the University of Manitoba Bisons, under the tutelage of Bisons legend Wayne Fleming. In that first year, the herd took home the Great Plains Athletic Conference Championship. Trotz left the following year for a stint with the Dauphin Kings of the Manitoba Junior Hockey League, before returning to the Bisons and succeeding Fleming as head coach for the 1987-88 season. Trotz helmed the Bisons for two seasons and then during the 1990-91 season began his professional coaching career with the Baltimore Skipjacks of the American Hockey League. He later became the head coach in 1992 and after the team relocated to Portland, Maine he won the Calder Cup Championship in 1993-94. Sirant and Trotz spent time playing together with the Bisons, and Sirent spoke proudly of his former teammate. Trotz’s NHL coaching career began with the Nashville Predators in 1998, where he had the distinction of being the first coach in the team’s history. He was let go after 15 years behind the Nashville bench and moved to Washington in 2014. Trotz is coming off his team’s second, of back-to-back, President’s Trophy winning seasons. The award is given to the NHL franchise owning the best regular season record – the Capitals finished with 120 points in 2015-16 and 118 in 2016-17. 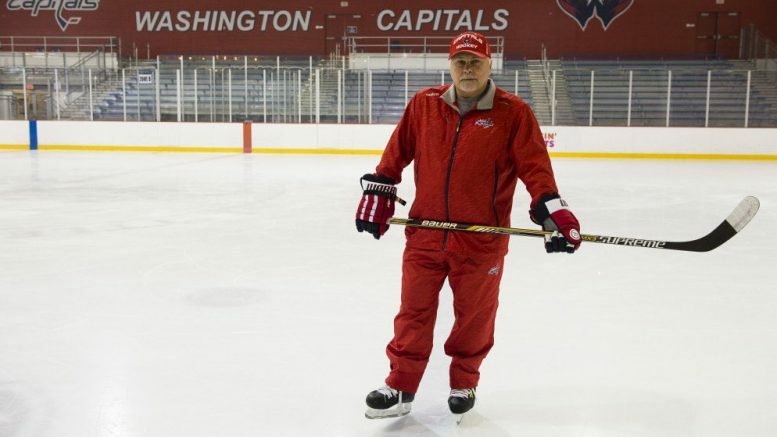 The 120-point season also earned Trotz a Jack Adams Award, given to the NHL’s best coach in a given season. With the current Capitals lineup, Trotz will likely have an opportunity to eclipse Arbour for fourth all-time next season. But for Sirant, he’s already made his alma mater proud. “We’re very proud of him, the Bisons hockey program with him being an alumnus with all the success he’s had,” Sirant said.